In this life, you're gonna have to eat and you're gonna need money. It's more efficient all around if you can find a way to combine the two, so with that in mind, we have quite an opportunity for you: there's a new dream job opportunity that will pay you thousands of dollars to travel all around the country, eat tons of delicious BBQ, and tell everyone about it on social media this summer. On Tuesday, Reynolds Wrap (that stuff you wrap your leftovers in) announced it is hiring a "Chief Grilling Officer," whose sacred duty will be to travel across the United States eating BBQ, documenting the eating of BBQ, and getting paid for eating BBQ. Best of all, the CGO will get to bring a friend (or a lover or a total stranger -- up to you!) for the BBQ sauce-fueled journey. 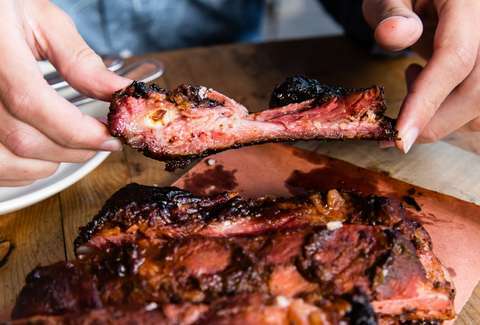 Reynolds didn't reveal exactly where you'll be traveling for the gig, but said "sampling and savoring grilled goods from some of the top barbeque cities in the country. Although the position isn't a traditional full-time job with a salary and benefits, you'll receive a $10,000 stipend for the two weeks you spend traveling across America with near-constant meat sweats, according to the company. As the name suggests, part of the idea here is to identify the best grilling techniques and share those tips with people on social media and the Reynolds Kitchens website. Better yet, travel and lodging will be taken care of for the entire adventure, so this $10,000 is yours to do what you please with. Here's how Reynolds described the ideal candidate for the job: "[I]f you don’t mind being paid to taste test some of the most delicious grilled dishes from across the country, posting envy-inducing pictures of your finds and falling asleep every night dreaming about your next meal, then you could have what it takes to be Reynolds Wrap’s Chief Grilling Officer." To apply for the CGO position, all you have to do to is submit 100 words about why you think you'd be a good fit, plus a picture of your favorite grilling recipe to ReynoldsCGO@gmail.com between July 31 through August 13. That's way easier than applying to a normal job and you can't bring your best friend to actual work so you should apply already.